Microsoft this week gave customers a bare-bones peek at the future of Windows, saying that the next iteration after Windows 8.1 Update will restore a Start menu and let users run "Metro" apps on the classic desktop. The sneak peek was part of the opening day keynote of Build, Microsoft's developer conference, which ran April 2-4 in San Francisco. "I'm not here to announce the next version of Windows," Terry Myerson, the head of Microsoft's operating systems engineering group, said at Build. "But I am going to share that we are going all in with this desktop experience to make sure your applications can be accessed and loved by people that love the Windows desktop." Myerson showed off two features of the unnamed update to Windows 8.1: A Start menu and windowed "Modern," née "Metro," apps on the desktop. As developers saw on the big screen behind Myerson, the new Start menu will be a blend of the traditional tool familiar to Windows 7 users and dynamic tiles that evoke the Windows 8.1 Start screen. The windowed Metro apps will be just that: resizable, draggable traditional windows on the desktop that will feature a title bar and the X-marks-the-spot close button to shut down the app. "We will be making this available to all Windows 8.1 users as an update," Myerson said. He did not offer up a date or even a broad release target, or say what the update would be named. The implication was that the update would be free to customers running Windows 8.1. Microsoft has been very careful to label free enhancements to Windows as "updates," a term it's decided does not require it to defer revenue from sales of the operating system. The company first spelled out the difference between "upgrade" and "update" in an August 2013 filing with the U.S. Securities & Exchange Commission (SEC). Because of that nomenclature, it's likely that Microsoft will not name this refresh as "Windows 9," which is what some observers have assumed. Unless Microsoft decides to call Windows 9 an "update" rather than the more typical "upgrade," and give away Windows 9 to Windows 8.1 customers. That's possible. Actually, it's a move that some analysts have suggested Microsoft make to answer Apple's decision last year to give away OS X upgrades. Microsoft's decision to restore a traditional Start menu -- an iconic user interface (UI) element in Windows that harks back to Windows 95 almost 19 years ago -- was in some ways not surprising. The absence of the menu, and the associated Start button, in the original Windows 8 of 2012 was widely criticized by customers and many reviewers. They saw the replacements, a "hot" corner and the radically different Start screen, as forced upon them and as productivity sinks that required relearning basic Windows navigation. Although Microsoft vigorously defended its Windows 8 design decisions, it also softened its stance when it shipped Windows 8.1 last October. 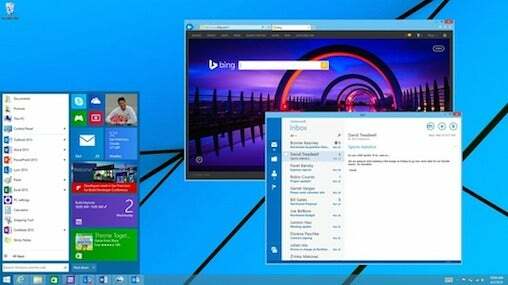 Windows 8.1 included a pseudo-Start button and gave users the option of circumventing the tile-style Start screen by booting directly to the conventional desktop. Windows 8.1 Update, which will begin reaching customers Tuesday, will expand the reemphasis of the desktop with the boot-to-desktop setting enabled by default on non-touch personal computers. Myerson's mention of the post-Windows 8.1 Update refresh was a return of sorts to a younger Microsoft that was more willing to discuss future plans, and a repudiation, perhaps a minor one, of the closed-mouth approach the Redmond, Wash. company has taken in the last several years. That approach was attributed to Steven Sinofsky, the former head of Windows development who was ousted in November 2012, but called counter-productive by many customers, partners and other outside observers. "It's always tricky to find the right balance when sharing future plans, as some parts of the plan may change," Myerson said in a blog he authored last week. "But as our industry, our company, and Windows are in the midst of a pretty massive transformation in the way we build and deliver innovation to customers, partners and developers, we are taking some steps to be more transparent in signaling what's ahead."